The last and final book in the bundle under the Christmas tree this year was this one. I don't really want to say anything more about it because she takes up too much of the internet as it is. She could send some blog followers my way. Anyway, she is the most famous blogger in the news right now. She is also from Oklahoma. So for the past few months, Maeve, Hilde and I have been following her to see what we're up against once we get there. She also homeschools and homeschool moms stick together (usually). The Pioneer Woman is also firmly cemented in Maeve's heart because she was on an episode of Throw Down with Bobby Flay. Throw Down is a Food Network show that we watch and The Pioneer Woman went up against Bobby doing a Thanksgiving dinner. She won, which was very cool. She is cemented in Hilde's heart because she has horses (tame and wild) and dogs on her ranch. So, when Daniel asked me this: "If I were to log on as you in Amazon, what would I click on and order as a Christmas present?" I said The Pioneer Woman Cooks. New recipes and a tutorial about life in Oklahoma, you can't beat that combination. She uses great photos. For a visual person like me this is huge. I find myself cooking through a recipe by sight and then I go back and read the captions. The layout is really beautiful, girly but beautiful. She cooks meat, lots of it and unabashedly. Hilde's vegetarianism aside, we are meat lovers in this house and her beef recipes are mouth watering. She does live on a cattle ranch, so I wouldn't expect less. She cooks comfort food. Meatloaf, prune cake and numerous other church lady recipes show up here. This is NOT a William Sonoma cookbook. No fancy food, just good food. I love meatloaf and it is Daniel's favorite thing I cook. So to "meet" another person who cooks meatloaf and talks about it is a good thing. Her Sangria looks awesome. I am not sure how she stays awake after she drinks it but the recipe looks potent and good. She loves her family. The cookbook contains just as many pictures of her family as it does her food. You get the sense that she wouldn't be the famous blogger author or speaker she is if it wasn't for her family. She does write blog and speak about her family so in one sense this is literally true. I am talking about in the deeper sense. Her family has shaped who she is and in a good way. (Not in the dysfunctional, my family has so many issues I am still recovering way.) Here at Sacramental Mothering, we like people who are transformed by their families. The only thing I take issue with is her lasagna. I am old school when it comes to lasagna. Lasagna should contain simple, Italian ingredients. The Pioneer Woman, heaven help her, uses breakfast sausage and COTTAGE cheese. It really is a tragedy because ricotta cheese was created to be in lasagna. She's never going to win a lasagna throw down. I can't imagine what lasagna tastes like with cottage cheese and I hope I never find out. Lest you think I am being too harsh on a stranger, my husband cooks lasagna with barbeque sauce and cheddar cheese. I have refused to eat it for 17 years. 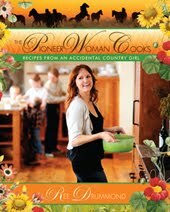 All in all The Pioneer Woman is someone I think I would really like. We both write, blog, home school, and love to eat meatloaf. Except for the lasagna thing, I think we'd get along famously. Maybe I will look her up when I get to Oklahoma and we can chat over a glass of sangria. 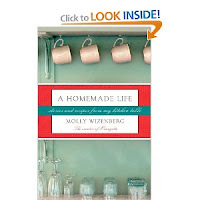 The next book in the review process is A Homemade Life by Molly Wizenberg. I will be honest and say that I wasn't thrilled at first glance. Molly is much younger than I am and my vanity didn't want to read a book written by a girl who has lived in Paris in her twenties, has a successful blog and accomplished all this before she was thirty. The only interesting things were that Molly is from Oklahoma, which is soon to my new home town, and she writes about food. I do however trust the giver of this gift. My friend April sent this book. I love my friend April. She knows me and she also likes to cook. So I figured if she thought I would like the book I would give it a try. It turns out April knows me better than I thought. I ended up loving this book because Molly seems to intertwine her memoirs surrounding food seamlessly with the actual recipes. She starts off the book with an ode to her father's potato salad. I was immediately smitten because in my family my mother's potato salad is a legend. She doesn't really have a recipe; she just cooks it by feel. This has made it almost impossible to replicate. Lucky for her Molly has her dad's recipe. I am sure it is good but it calls for ranch dressing and caraway seeds and that's not in my mom's potato salad. So I am sure my mom's is better. Each recipe in this book is preceded by a story about the item of food and how it is connected to someone special in Molly's life. Her father looms large and her mother's Christmas cookies make a great story. Other recipes from her time in Paris and her boyfriend turned husband make appearances. Somehow the combination of story and recipes turns the cookbook into something more inspirational. I actually want to make all these recipes. Usually, I am a very utilitarian cook. I cook well but I like to get in the kitchen and be done. The eating and conversation are the fun parts for me. So, when I found myself enrapt in this book I was surprised; the most I ever do with cookbooks is browse and maybe make a grocery list. Now, I can't wait to make her roast cauliflower, her French bread and chocolate, the list of Christmas cookies and maybe, just maybe the potato salad. Maybe, but I won't like it.